It was a time when many of the country’s crusaders of science communication were experienced with massive science communication exercise of Bharat Jana BigyanJatha and Bharat Jana Gyan Bigyan Jatha. It was felt that the large scale activities for developing science awareness among the masses are to be continued as regular activity, so, this programme was launched nationwide in 1993, under nomenclature National Children’s Science Congress (NCSC), with an expectation that it would generate scientific temperament among the teachers and students, and spread among the various stakeholders of the society. The programme of NCSC has been fruitfully conducted for the last 22 years. National Children's Science Congress (NCSC)-విద్యార్థుల్లో సైన్స్ పట్ల అవగాహన: An ideal and innovative programme for children to Inspire, Empower and Expand their Minds to World !. 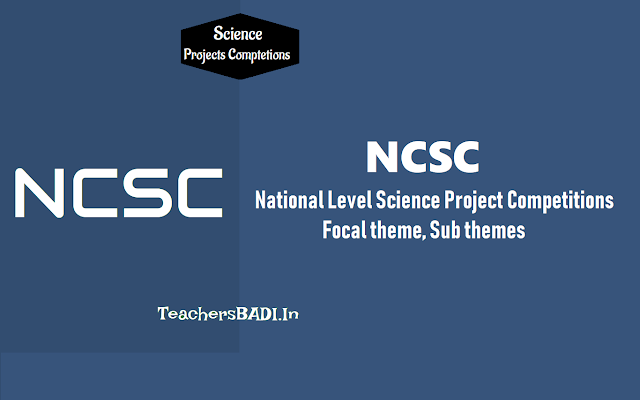 National Children's Science Congress (NCSC) is a nationwide Science Communication programme started in the year 1993. It is a programme of National Council for Science and Technology Communication (NCSTC), Department of Science and Technology, New Delhi. It is a forum children of the age-group of 10-17 years, both from formal school system as well as from out of school, to exhibit their creativity and innovativeness and more particularly their ability to solve a societal problem experienced locally using by method of science. Online registration through NCSC Web-portal www.ncsc.co.in is going on. to avoid the complications in future, please direct your district coordinators to take care and promote the children group those are participating in the NCSC 2016 to login the web-portal and register them selves also support them. Some of the children groups have already registered them selves. Please instruct the district coordinator to check the groups and approve the same in their respective district by login district coordinators id and password. the User ID and password of each District Coordinators have already been provided to each state Coordinators in the last year. District Coordinator should upload the district events in the event menu so that the information shall go to the registered participants in time. Similarly each state coordinator must upload the State events in their menu by login the website. Note: if any registered (group) participants shall miss or not participate in the district or Sate level event of CSC without having proper information on website, the respective District and State Coordinator will be responsible for any complications or Query raised. This has already been informed to all PIs of NCSC during the Project presentation meeting. 5. National Level Congress : National Children's Science Congress from 27th Dec to 31st Dec 2018 at Gujarat. > 4. చివరగా 2019 మార్చి లో "ఇండియన్ కాంగ్రెస్"
National Children Science Congress is going to held a National level Competition at any state. Venue will be announced.